Starting a new business takes courage, capital, passion, and persistence, even in Austin, Texas, a city known for its culture and lifestyle appeal. But having the right business and economic environment – issues like good small business job growth, median income and unemployment rates – matters, too. New businesses need to have access to a highly trained workforce, and that’s one of Austin’s greatest assets. In January, Popular Mechanics recognized Austin as one of the country’s best start up places, partly because of its abundance of tech talent. The Central Texas town is home to the University of Texas’ McCombs School of Business and local programming schools and bootcamps, like MakerSquare. 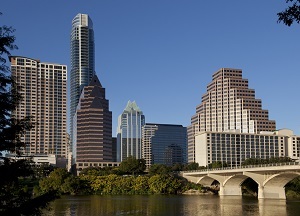 In addition, IBM, Texas Instruments, and other hardware companies are based in Austin. These are just a few of the reasons why Google Fiber, a superfast broadband internet and cable television service, expanded to Austin two years ago. Austin also has a reasonable cost of living and low unemployment. According to a Kiplinger Magazine, the city has a 4.2 percent unemployment rate, and the cost of living is about 5 percent below the U.S. average. Overall, Kiplinger ranks Austin as the fifth best place in the U.S. to start a business. Entrepreneurs will also be pleased to know they can find mentors in Austin to help them navigate the tricky challenges and opportunities that come with starting a business. Austin technology start-ups have access to Capital Factory, a business incubator and shared workspace, and the Techstars business accelerator. The city also hosts the Austin Startup Games, a friendly business competition and fundraiser for local charities. Last, and perhaps most importantly, the availability of investment in Austin is significant. Recently, Investopedia named Austin as one of the five of hottest startup cities for 2015, noting it received about $620 million worth of funding in 2014, a 40 percent increase from the previous year. Ready to take advantage of all Austin has to offer your small business? Select your company’s Austin phone number now. This entry was posted in Small Business by Guest. Bookmark the permalink.